Wells Fargo & Company (NYSE:WFC) today announced the company will deploy its Mobile Response Unit to help Houston area customers impacted by recent flooding with housing recovery assistance and who have financial hardships caused by the disaster. The Wells Fargo Mobile Response Unit is located in Houston at 4010 S. Braeswood Blvd. Customers may visit from 9 a.m. – 7 p.m. weekdays and 9 a.m. – 2 p.m. on weekends through July 2. 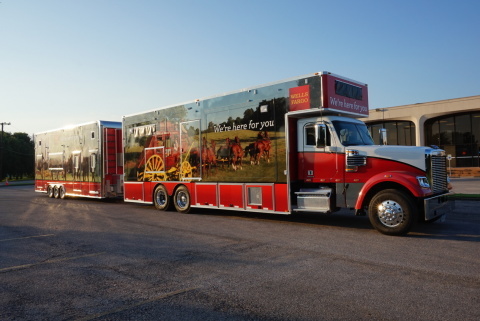 Wells Fargo’s Mobile Response Unit is a 75-foot, heavy-duty commercial “office on wheels,” designed to bring valuable information directly to customers in communities Wells Fargo serves after a disaster. The Mobile Response Unit has private offices and is equipped with computers, cellular data feed with satellite backup and is powered by self-contained generators. There are specialized team members on board to provide in-person mortgage assistance, insurance claim check processing, and tips to start the repair and recovery process in the event the customer was impacted by the flood. Wells Fargo Home Mortgage customers who are faced with payment challenges will also have the opportunity to meet face-to-face with our home preservation specialists and HUD-approved credit counselors to explore the options available to them. The decision to build the unit was made after Wells Fargo responded to hundreds of customers who had homes damaged by disasters such as Hurricane Sandy, the Oklahoma tornados and the Colorado wildfires. Wells Fargo Home Mortgage customers in Houston who were affected by the floods should contact Wells Fargo Disaster Assistance Team at 888-818-9147 as soon as they can to discuss payment arrangements or for assistance with property insurance loss claims. The team is available Monday through Friday from 6 a.m. to 10 p.m., and Saturday from 8 a.m. to 2 p.m. CST to help, offer guidance and information about loans and assistance programs. All other customers impacted by the floods who need assistance can contact Wells Fargo 24 hours a day, seven days a week at 1-800-TO-WELLS (1-800-869-3557). Visit Wells Fargo’s Get Help with Disaster Recovery web page for additional details.